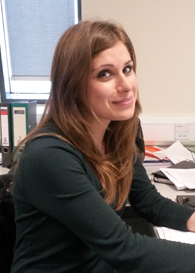 Astrid’s research interests focus on organocatalytic asymmetric reactions involving enolisable cyclic anhydrides. S. A. Cronin, A. Gutiérrez Collar, S. Gundala, C. Cornaggia, E. Torrente, F. Manoni, A. Botte, B. Twamley and S. J. Connon* Org. Biomol. Chem. 2016, 14, 6955.